> AQUA – the coolest event by the Manila Bay area's Manila Ocean Park. 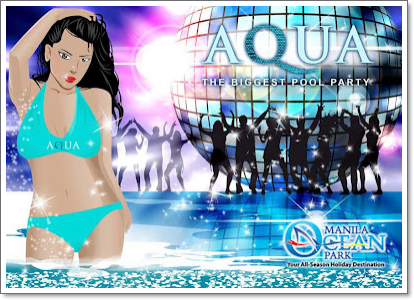 AQUA – the coolest event by the Manila Bay area's Manila Ocean Park. Last April 28, 2012, everyone dressed up in his or her best summer fashion and had a fantastic time at Manila Ocean Park. AQUA – the coolest event by the Manila Bay area was presented by the Manila Ocean Park. Bloggers, invited guests, tour operators, patrons, literally swim, party and groove the night away. Everyone had a fabulous time with the performances of top local bands Silent Sanctuary, Tanya Markova, Moonstar 88 and more. Guests had refreshing drinks at Liquid Pool Bar and Lounge and listen to the pulsating beats of house music and club DJ. It is also the grand launch of Brand magazine - the newest hip publication in town. and be mesmerized with graceful dancing fairies of the sea in Jellies Exhibit. At nighttime, a fusion of laser lights, water screens and other special effects are the highlights of the spectacular AQUA Musical Fountain Show. AQUA was an event that we didn't miss since this is the introduction of the latest technology to make Manila Ocean Park the first high-tech theme park in the country. The park has recently launched instant information download through mobile phone and other digital enhancements for guests' ease of access and convenience. We had availed of an e-wrist tag that lets us access Facebook and Twitter in real time. It automatically posted status updates and shared them to our friends while we're having fun in different attractions. Imagine how cool was that! Ticket price is P300 inclusive of entrance to AQUA, 2 drinks and e-wrist tag and was sold at Manila Ocean Park. For details, visit www.manilaoceanpark.com or call 567-7777 loc. 151 and 155.